New Delhi : Priyanka Chopra and Nick Jonas grand wedding is over and now, what else! Well, its time for an extravagant reception in New Delhi on December 4. The love birds got hitched at the Umaid Bhawan Palace in Jodhpur on December 1 and 2. Tonight, in the reception, the guest lists include Chopra and Jonas families beside politicians, friends and other celebrities. The post-marriage party is lighting up the aura of Darbar Hall, Taj Palace Hotel in Delhi. 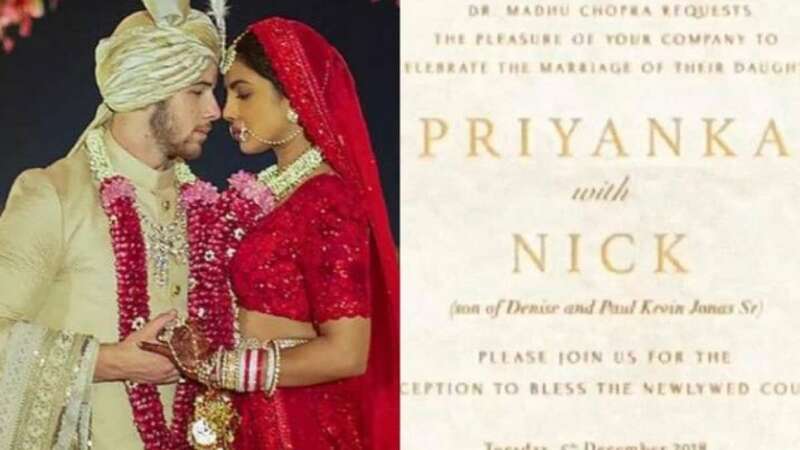 People magazine has shared some special photographs of Priyanka Nick wedding. In one picture, Priyanka is seen wearing a Ralph Lauren gown with a long trail during the Christian wedding while Nick opted for a black suit. While in other picture, the diva can be seen in a red lehenga and Nick in a beige sherwani during the Hindu wedding ceremony. Priyanka and Nick tied the knot in two elaborate ceremonies in Jodhpur’s Umaid Bhawan Palace over the weekend. While they exchanged vows in a Christian wedding on Saturday, a traditional Hindu ceremony took place on Sunday. Priyanka, who is 36, wore a red sari, while Nick, 26, was dressed in a traditional outfit and turban, People magazine reported late Sunday. For their Christian wedding, the couple wore custom-made Ralph Lauren outfits and their wedding parties also donned the same label. The Hindu wedding took place at the Umaid Bhavan palace grounds with the complete Jonas family in attendance. Nick’s parents Denise Jonas and Kevin Jonas Sr, a pastor who officiated at the Christian wedding, and his brothers, Kevin, accompanied by wife Danielle, Joe and his fiancee, Game Of Thrones star Sophie Turner, and Frankie Jonas. From the bride’s side, all her close friends and family members, including mother Madhu Chopra, brother Siddharth and cousins Parineeti and Mannara, were present at the ceremony. Prior to the Hindu wedding ceremony, Priyanka and Nick had traditional mehendi and sangeet functions. The couple wore outfits by designer duo Abu Jani and Sandeep Khosla for both the ceremonies. To inform, the wedding rituals were held secretly and no media were allowed in the venue. Even the guests were asked not to bring mobile phones with cameras. Other than select pictures from the mehendi and sangeet that were released to the media, only one grainy photograph of Priyanka in red was circulating on social media.